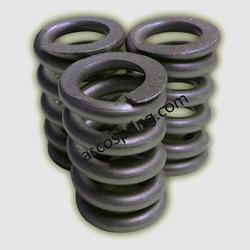 Asco proffer a wide range of Railway Bogie Springs, produced from superior quality spring steel, which is assured during the quality check process at each stage. 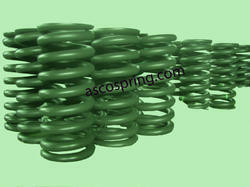 Asco an eminent Railway Bogie Springs manufacturer and Bogie Springs exporter of Worldwide. Asco equipped with highly qualified team of professionals, that are responsible all good commitments. 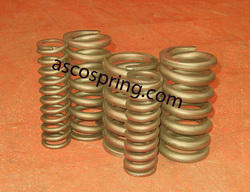 Asco springs possess a strong load bearing capacity, owing to which, these are widely appreciated and demanded by the customers. These are available in varied sizes and highly competitive prices, thus meeting all industry regulated standards. Materials Grade : As per Client requirements. Our clients can avail from us an extensive range of Railway Air Brake Cylinder Springs (AE-13) which can be customized as per the specification provided by our clients. Our products are manufactured using premium quality raw material and are available in the industry leading prices. Plunger spring-13 SWG wire dia. We proffer a wide range of Bogie Springs, produced from superior quality spring steel, which is assured during the quality check process at each stage. We are an eminent Railway Bogie Springs manufacturer and Bogie Springs exporter of India. We are equipped with highly qualified team of professionals, that are responsible for our delivery of excellence. 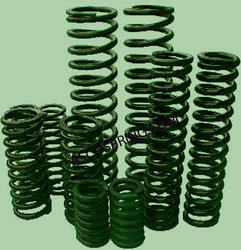 Our springs possess a strong load bearing capacity, owing to which, these are widely appreciated and demanded by the customers. 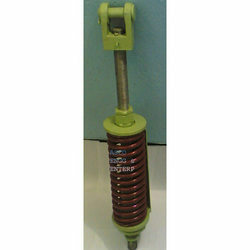 These are available in varied sizes and highly competitive prices, thus meeting all industry regulated standards. Characteristics: These springs are made up of round and coiled wire, wrapped in cylindrical shape with a provided pitch between the coils. A larger gap is provided between the successive coils, ensuring the flexibility of the springs while expanding or contracting. 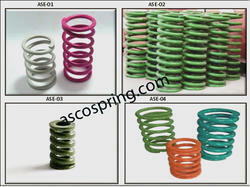 Asco offer superior quality railway Bogie Spring, which are used in Railway's Bogies, Suspension. Asco range of equipments is manufactured from quality material that is procured from the reliable vendors of the Railway industries. Bogie Spring railway spares are manufactured with utmost care and precision to ensure they are long lasting, durable and tensile. Available in wide applications, these Railway Equipments can also be customized as per the clients requirements. We offer superior quality railway equipments, which are used in Railway Bogie Springs, suspension spring,Buffer Spring,Air brake Cylinder, manufacturing. Asco range of equipments is manufactured from quality material that is procured from the reliable vendors of the industries. Railway Spring of spares are manufactured with utmost care and precision to ensure they are long lasting, durable and tensile. Available in wide applications, these Railway Equipments can also be customized as per the clients requirements. Asco clients can avail from us a wide range of Bogie Suspension Springs which is widely used in elevated temperatures high load applications in a corrosive environment. These are available in the different dimensions and finds application in automobile agricultural industries. Backed by our dedicated workforce and hi-tech infrastructure, we are capable of manufacturing hot coiled springs upto 92mm or 3.62 inch wire diameter and OD 450mm or 17inches. Striving towards excellence, our firm is indulged in manufacturing, supplying and exporting excellent quality Railway Wagon Springs. 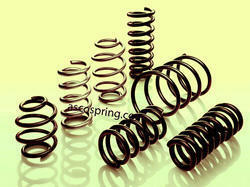 Our springs are precisely engineered in our sound manufacturing unit under the surveillance of adroit professionals. Owing to its excellent strength, flawless finish, minimal maintenance and longer operational life, our wagon spring is highly demanded by the customers. Clients can avail this Railway Wagon Spring in various sizes and specifications from us. We are engaged in offering a comprehensive range of Belt Tensioning Devices (AE-01) which is available in the industry leading prices. These are manufactured using helical compression spring, pin bolt, sheet & other items and are available as per railway's drawings & specification. 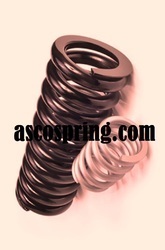 Asco Spring Manufacturers, Exporters Designers and OEM Suppliers of all types of Railway Spring like Bogie Springs, Wagon Springs, Buffer Springs, Suspension Springs, Snubber Springs,Buffer Spring, Bolster Spring, Brake cylinder Release Springs of any type and design. Wire Dia. - Upto 65 mm. Out Side Dia. - Upto 500 mm. Free Length - Upto 1000 mm. Total Coils - As per Drawing / Specification. Load Bearing Capacity -As per Drawing / Specification. Materials Specification-As per Drawing / Specification. Looking for Railway Equipment ?